Join us on this thrilling mountain biking holiday through the trails of central Italy. We trace the steps of the Via Romea Francigena, an ancient route between the northern regions of Europe and the south, carrying merchants, armies and pilgrims from as far as Canterbury to Rome and on to Jerusalem. Now the Via Romea Francigena is a network of trails, roads and tracks that are followed not only by faithful pilgrims on their way to Rome, but also walkers and bikers who are looking for an exciting journey. We have chosen to start our adventure in Siena, one of the gems of Tuscany, a medieval city packed full of art, architecture and fantastic Italian cuisine. 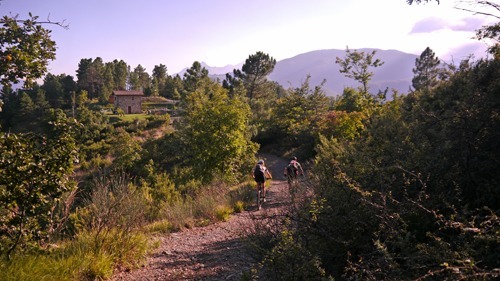 Heading south, we'll follow the the Via Romea Francigena as much as possible, exploring the paths, off-road trails and singletrack along the route, making this a great mountain biking journey through stunning Tuscany. The route joins up some of the major Tuscany highlights, such as Siena, Montiriggioni and San Quirico. Staying in a range of good quality small hotels and agriturismi, you'll experience real Italian hospitality all with delicious regional cuisine. As we leave Tuscany and enter Lazio, the landscape changes as well as the feel of the towns. The journey south through varying landscapes and changing terrain, using sections of the EuroVelo 5 route, leads to the outskirts of Rome where our own pilgramage comes to a dramatic end, riding into St Peter's Square. If you wish to do this journey in a more leisurely manner, on non-technical terrain and on hybrid bikes we've a Leisure cycling option you'll love! Are you ready for a NEW Cross-country challenge? The post Are you ready for a NEW Cross-country challenge? appeared first on Skedaddle Blog.